Be warned. This article will have you running to the baker to get your hands on some cake before you’re done reading. It used to be tradition to throw wedding cakes at brides as a symbol of fertility. In case you were wondering, that’s not great wedding cake etiquette these days. Back in the seventeen and eighteen hundreds wedding cakes were also a symbol of social standing, as the sugar, fruit and alcohol in fruit cakes were all expensive ingredients. As an added bonus, these pricey cakes were less likely to spoil, allowing the supposedly prosperous and fertile couple to stick to the tradition of eating the cake on their first wedding anniversary or the christening of their first child. There are a number of other traditions associated with the wedding cake, but we probably don’t need to delve much further into the subject to see that it may be time for the wedding cake to evolve. For those who do not particularly enjoy the traditional fruit cake, the wedding cake has already evolved to make allowance for tiers of decadent flavours such as dark chocolate, red velvet and raspberry. And if that’s not tempting enough, cake wizards now include the most scrumptious sweet and fruity fillings and top the cakes off with anything from ombré to all metallic fondant icing and decorations. Is it at all possible then, with such variety, that it’s time for the wedding cake to evolve again? Or at least time for another wedding cake alternative to enter the party? One that, like a pair of jeans, can be dressed up or down to suit the personality of the bridal couple. This perfect contender may just be found in the humble cupcake, once bound to kids’ parties and fun fairs. When dressed for the affair however, in a detailed laser cut cupcake liner or pink champagne flavour for example, the fun but simple cupcake becomes a dainty lady dressed in lace. A little digging will prove that the wedding cupcake can be every bit as elegant and show stopping as any finely decorated white wedding cake. She’s modern, she’s cheeky and she’s a perfect wedding showpiece. Here are a six reasons to consider the wedding cupcake as your cake alternative. She’s modern, she’s cheeky and she’s a perfect wedding showpiece. As mentioned, cupcakes can be adorned with the most beautiful and finely crafted fondant decorations. This allows each guest to appreciate the detailed work that went into your theme fitting cake even if they weren’t able to catch much of the cake cutting ceremony. You don’t have to forego the cake cutting tradition either – create a more intimate and meaningful ceremony by making a big do of breaking and sharing a cupcake with your partner. There are beautiful cupcake stands available that allow you to display your cupcakes while keeping your wedding table tidy and clean of messy cake crumbs. A clean display with elevated cupcakes will allow your cake decorator to incorporate flowers, exactly as she would with a cake. In other words, you don’t have to hold back on decorative cake toppers or finely crafted fondant flowers, when you opt for cupcakes instead of a traditional cake. By the time the cake finally makes it to the tables, most guests can be found at the bar, on the dance floor or even at home. Fortunately, cupcakes can be eaten by hand and require no plate, fork or chair, so your guests can enjoy them on the go. Any leftover cakes can be boxed and gifted to special guests or offered to close family and friends for tea the next day and still look beautifully appetizing. Two slices of cake on a tiny cake plate look glutinous. Two cupcakes on a plate, however, make a sweet pair. Guests usually feel poorly for asking for two slices of cake, but few guests will deny wanting to taste the fruit cake as well as the coffee cake, given the opportunity. Because cupcakes are more contained and don’t require a fork, they’re much better suited for sharing with other guests. This allows everyone to get a taste of the delicious flavour combinations you have wisely selected. Two slices of cake on a tiny cake plate look glutinous. Two cupcakes on a plate, however, make a sweet pair. 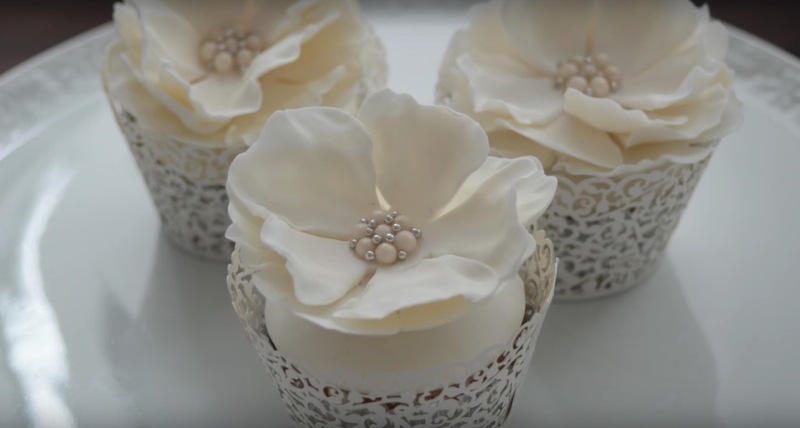 Beautifully crafted wedding cupcakes with a lace or flower theme can be used in the place of expensive table flower arrangements. In addition to saving costs, a floral cupcake arrangement can form a fantastic conversation starter. This clever idea will enable you to specify the exact colour of your flowers, even if they’re out of season. Another great space and money saving idea is to box your wedding cupcakes and use them as table favours. You can even personalise them with a hand written thank you card. An emerging wedding cake trend is giving the groom his own and usually quirky cake. Few brides may appreciate a Lego or Star Wars cake standing next to what is likely the most expensive and beautiful piece at the wedding, second only to her dress of course. Having wedding cupcakes allows the couple to have a mix of quirky and feminine, his and hers cake, without ridiculing the whole affair. If you like the idea of a tiered display of cupcakes, it’s also a good opportunity to hide the fun cakes in the centre and place the more elegant ones on the outside to create a beautiful traditional display for guests and photos. Traditional wedding cakes are gorgeous, but their smaller, more modern and more versatile cousins pack a surprising punch. They’re a wedding cake alternative capable of doing the job, and possibly even a little more. The modern couple that is keen on different wedding ideas now has at least six good considerations in favour of the wedding cupcake and may find that it’s the perfect blend of tradition and fun to suit their pallet.